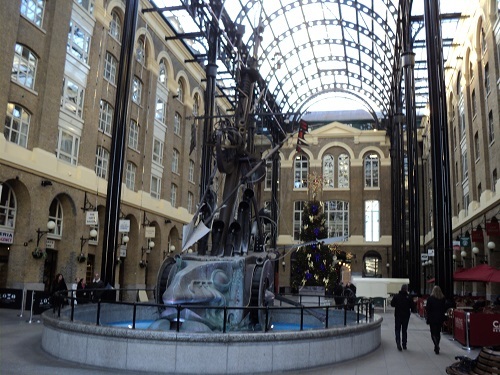 Hay’s Galleria is a Grade II listed building in Bankside which is a mixed use complex that includes restaurants, shops, offices and apartments. 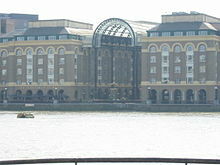 The Galleria has been developed using the warehouse and associated wharf (Hay’s Wharf) that was created in 1859. The wharf had an enclosed dock which in the 18th century was a major wharf for bringing Tea into London. Damaged by the Great Fire of Southwark in 1861 and by bombing in the Second World War it was often rebuilt, however it was the demise of the London Docks that led to Hay’s Wharf closing in 1970. 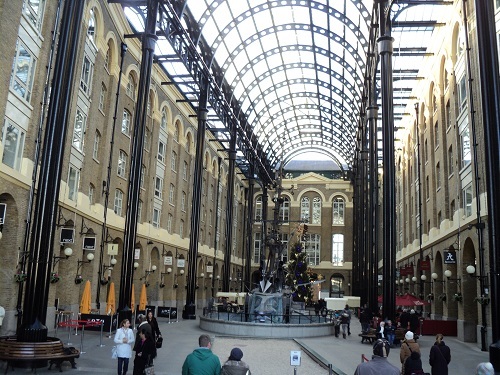 In the 1980s the area was developed by the St Martin’s Property Corporation and Hay’s Galleria was created by closing the dock gates, covering the dock and covering the entire space with a glass roof. The centrepiece of the Galleria is a 60ft moving sculpture of a ship called ‘The Navigators’ by David Kemp which was unveiled in 1987. One of the early developments on the South Bank in the 1980s, it still attracts many visitors who walk along the South side of the Thames. By londonvisitors2014 in Bankside, London Restaurants, Shops of London on January 1, 2014 .